Isobar is a global agency that delivers digital transformation, powered by creativity. They solve complex business challenges through digital marketing, ecosystems and products, driving digital strength and brand loyalty. The company has many high profile clients including Coca-Cola, Adidas, Enterprise, P&G, Philips, and Huawei. 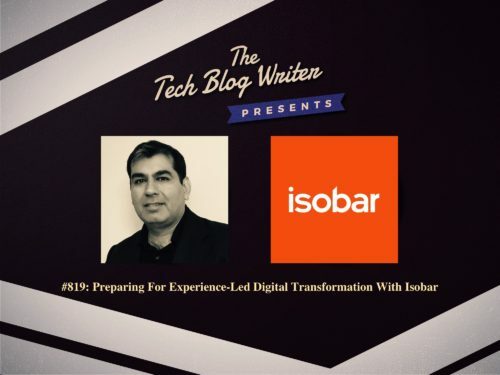 At the recent Adobe Summit, I met with Vikalp Tandon, Global CTO, Isobar. Vikalp is responsible for expanding its data and technology consulting offering globally by working closely with the multi-disciplinary teams across Isobar’s 45 markets. Vikalp has over 15 years of experience in delivering multiple large scale, multi-market technology products, consulting complex technical solutions and establishing offshore delivery teams. Vikalp is tasked with connecting the strong and growing technology and commerce community at Isobar whilst leveraging the agency’s global technology partner relationships with Adobe, Salesforce, SAP Hybris, Sitecore, Magento, Google, Microsoft and more, to further enable the company to deliver experience-led transformation for clients.